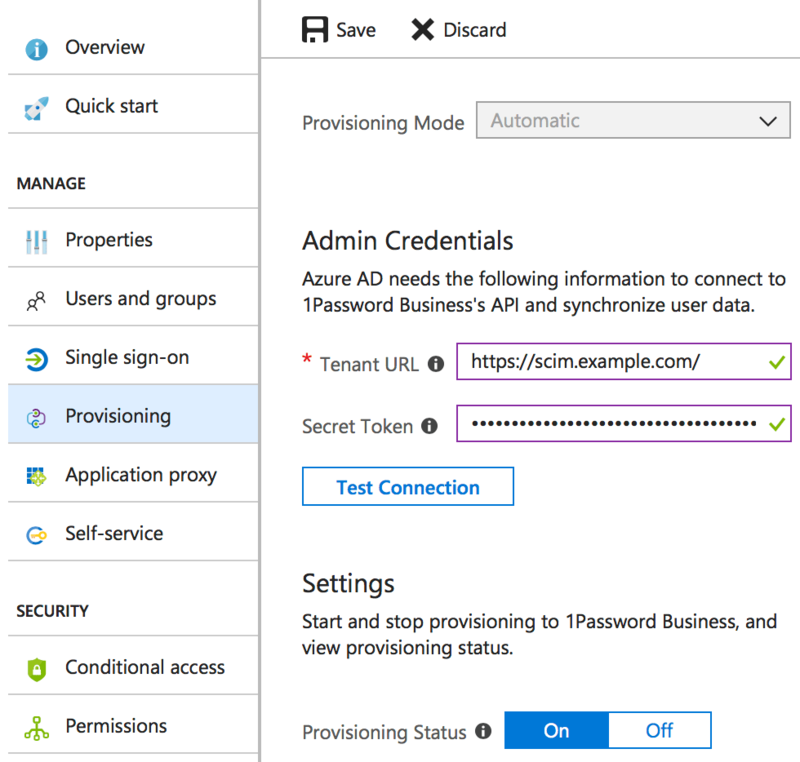 Before you can configure Azure Active Directory, you’ll need to set up and deploy the SCIM bridge. To get started, sign in to your account on the Microsoft Azure portal and follow these steps. Click Azure Active Directory > “Enterprise applications” in the sidebar. Click “New application” , then click “Non-gallery application”. Enter “1Password Business” for the display name and click Add. Click Provisioning in the sidebar. Set Provisioning Mode to Automatic. Enter your Tenant URL and Secret Token. Set Provisioning Status to On, then click Save. To sync only specific users and groups, set Scope to “Sync only assigned users and groups” and click Save. To manage assigned users and groups, click “Users and groups”. To restart synchronization, turn on “Clear current state and restart synchronization” and click Save. To turn off synchronization, set Provisioning Status to Off and click Save. Learn more on the Azure Active Directory Documentation.